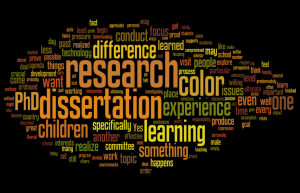 Dissertation writing is not an easy task because it requires you to think of a good topic. So what constitutes a good topic? It should be one that covers a topic in depth on your course, where there is a compelling reason to discover more, and one where there exists a sound base of theoretical knowledge. The reason why some students do not perform so well in their dissertation is because it is a test of “application”, instead of a test of “memory”. Students may be able to get away with regurgitating material for examinations but the dissertation requires a different set of skills with a specific technique for each section. Also if you choose a poor topic, the route ahead becomes increasingly challenging so its better to change your route at the beginning. Firstly, students must choose a topic that really interests them. This is absolutely vital or you will get bored along the way and lose interest. This maybe an area that took your interest somewhere along the course. Or, if nothing interested you, then you must read widely in the journal database to find areas that are interesting and where you really want to discover something. Students must also bear in mind their strengths and weaknesses. If you know that your mathematical skills are not that strong, it would not be wise to choose a methodology that uses advanced statistics in SPSS as you will suffer later on. Even if you can perform the calculations, are you sure you can translate it in an extensive piece? In dissertation writing you must choose a topic that really interested you and you know you can do well in. So the question to ask yourself is, am I better at quantitative or qualitative research? Then be honest with yourself and choose the correct route. The dissertation writing process is meant to be an enjoyable one, not one that you fear doing each day. Secondly, each University will prescribe a research book but remember to use it as a reference guide only, then you must apply it wholly to your research situation. Too many students offer an explanation that is too general which shows that your study is not focused enough. Thirdly, once you have your research topic and a good idea of the methodology to use, I would recommend that you start with the Literature Review Section first because this gives you an idea of what academics have studied already on this area. Choosing relevant journals that are new, from top Universities, and offer different well written ideas are important. Fourthly, after the LR you should formulate your objectives and think about writing the Methodology. Lastly, do not forget to choose topics and gaps in knowledge that have never been researched in all the academic reading you have done. This will engage you further to demonstrate your unique excellence in tackling the research phenomenon. Finally, get into a daily habit with your dissertation writing and commit to writing some each day. This will make the whole process less daunting if you break it up into small sections. Try to avoid completing it in the final weeks up to the deadline. This is because you put yourself under immense pressure and are less likely to get a good mark.